Godiva (or Godgifu) was the wife of Leofric, the Anglo-Saxon Earl of Mercia, one of the most powerful men in England. Amongst many other holdings, Leofric and Godiva held the villages of Kingsbury and Coventry. 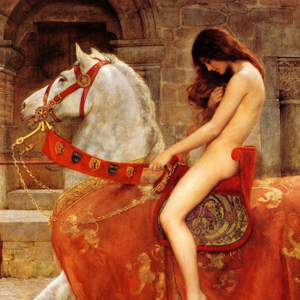 Legend has it that Lady Godiva rode naked through the streets of Coventry in protest at her husband’s heavy taxes on the people of that town. Her husband relented and lifted the taxes. She is mentioned in the Domesday survey of 1086 as one of the few Anglo-Saxons and the only woman to remain a major landholder after the Norman Conquest. Her granddaughter, Edith (or Ealdgyth), was married to King Harold Godwinson, the last Anglo-Saxon king.